The number of drug overdoses has grown exponentially for at least the past 38 years, a new analysis of Centers for Disease Control and Prevention data argues. More than 70,000 people died from drug overdoses in 2017, once again making drugs the leading cause of non-medical death in the United States. Those overdoses were driven in large part by opioids, especially the synthetic opioid fentanyl and its analogs. The paper, which appeared late last week in the journal Science, attempts to set the current opioid overdose crisis in the context of the long-run trend in drug overdoses in the United States. The results are startling. The study's authors found that the number of overdoses per year has risen steadily at an accelerating rate. For the data they looked at between 1979 and 2016, the number of drug overdose deaths doubled roughly every 9 years, rising from 1 death per 100,000 people in to over 17 deaths per 100,000 people. The study also decomposes drug deaths since 1999 by type, looking at which drugs are driving the net increase. Fentanyl, heroin, and prescription opioid overdose rates have all risen over that time period. But so too have overdose rates from methamphetamine and cocaine, indicating that America's drug addiction encapsulates more than just opioid abuse. The populations impacted by these different drugs were not obviously uniform. Overall drug use concentrated among older Americans, and more frequently men than women. However, urban and rural people were equally affected. Although white Americans more frequently overdosed, black Americans suffered substantially as well, thanks in large part to cocaine. Looking at the spatial distribution, the study found that some drug deaths concentrated in certain areas, but few areas of the country were spared from some kind of overdose crisis. The implications of this analysis are two-fold. 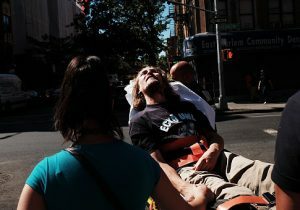 Firstly, America's overdose crisis is not neatly described by focusing on one particular drug—the steadily rising rate has persisted through various drug "fads," and Americans are dying from a number of different drugs. Secondly, as the authors note, "the opioid crisis may be part of a larger, longer-term process." The standard story of America's current addiction crisis is that a wave of prescription drugs, pushed by major pharmaceutical firms in the 1990s, sparked a steady boom in overdose deaths. But the long-run secular trend in overdoses—which passes through several distinct periods of addiction—indicates that something more fundamental may be at play. "Understanding the forces that are holding multiple subepidemics together into a smooth exponential trajectory may be important in revealing the root causes of the epidemic, and this understanding may be crucial to implementation of prevention and intervention strategies," the study's authors write.